Indices that act as benchmarks must be investable and replicable. In order for institutional investors to be able to invest, crypto currencies must be able to be held in custody by professional custodians. The LY Incrementum Krypto Index takes into account the requirements of institutional clients with regard to investability and replicability. The complex cryptoasset market environment inspired a joint innovation between LIMEYARD and Decentriq, two Swiss-based companies. 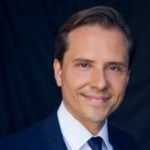 They combined their expertise to develop a comprehensive cryptoasset index aimed at capturing the dynamics of the overall cryptographic assets market whilst dealing with unique regulatory and economic challenges embedded in this premature market. For investors, an index must be tradable, meaning that liquidity and rebalancing are feasible. Furthermore, the cryptographic assets market presents specific challenges regarding regulatory requirements, such as the exclusion of investments in privacy coins or coins that are only traded on one exchange. Active asset managers typically use a benchmark to measure the performance of their portfolio in relative terms. They assess market efficiency and price systemic risks using benchmarks. Prior to setting up a fund strategy, asset managers apply various risk models and compare the past performance of the strategy against the underlying benchmark, long-term outperformance being their aspired goal. The benchmark itself is performance-agnostic. Passive asset managers (e. g., ETF providers), on the other hand, invest into a portfolio which tracks an index. Their underlying question is: what new strategy, theme, region, sector, etc. could be a great investment opportunity for investors? The ETF provider simply tracks a factor/risk model-based index, e. g., a low volatility index, a momentum index, a quality index, etc. For active and passive managers, “tracking the market” has the same meaning; however, for the latter, the index concept reflects an investment strategy. In other words, active managers use the benchmark to track the market as a whole, and is therefore performance-agnostic, as long as the performance is in line with the overall performance of the market. On the other hand, for passive investors the index represents an investment strategy with the clear ambition to achieve long-term positive performance. In both cases, the index is rules-based, meaning it’s not subject to discretionary decisions. Creating an index that accurately tracks the market requires consideration of three main factors: reflecting market dynamics, maintaining/governing the respective rules, and preventing manipulation. Reflecting market dynamics: This requires compliance with data sufficiency, as data are the main ingredient of every benchmark. Insufficient availability of data bears the risk of not adequately representing a market. Maintaining/government rules: To be fully rules-based and transparent, the methodology of an index has to be applicable under all market circumstances avoiding the necessity for a discretionary interference. Manipulation prevention: Internal operational processes have to be designed to prevent index manipulation (last experienced with the LIBOR scandal in 2011). IOSCO, the international body of the world’s security regulators, defined the IOSCO Principles for Financial Benchmarks, consisting of 19 principles for index providers to adhere to, all of which are implemented in LIMEYARD’s governance structure and audited on an annual basis. LIMEYARD and Decentriq faced two main challenges when creating a comprehensive cryptographic market index: How to handle (1) a highly dynamic market with numerous, partly unknown factors influencing its overall development and (2) practical requirements of a benchmark that make the index rules-based, transparent, and compliant. The result of this challenging endeavour is the LIMEYARD Crypto Assets index (LYCAI), consisting of the largest 20 cryptoassets that are publicly tradable. To be part of the LYCAI, an asset has to fulfil several parameters to ensure sufficient robustness, liquidity, and tradability. The index is calculated in real-time 24/7, using trading data from eight different exchanges. The aggregation over several trusted exchanges improves robustness against exchange-level failures and price manipulations, providing an adequate representation of the underlying market. The selected exchanges have, among other things, a comparably high monthly liquidity. 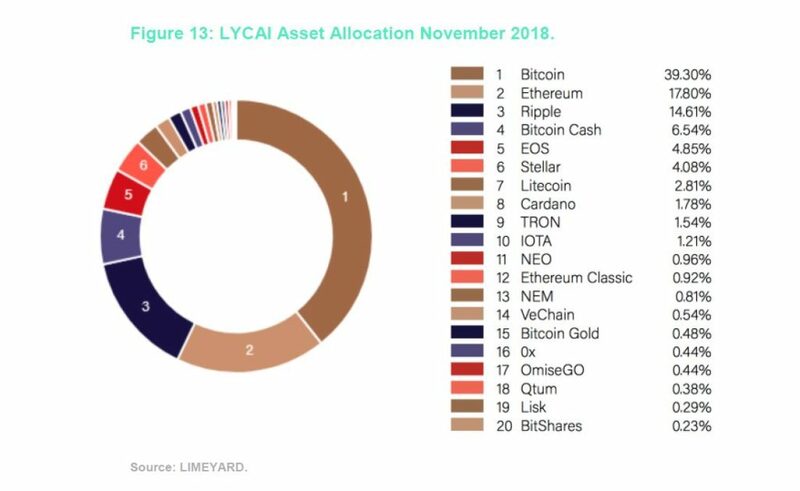 LIMEYARD is only considering assets that are traded on at least two trusted exchanges. This ensures that, if one exchange experiences any technical issue, the index can continue to pull price data on the full predefined set of assets. The price data aggregation algorithm factors in both volumes and outliers, reducing undesired spikes in the index level which could happen in a young and fragmented market. Additionally, only the assets that are in the top 60 % in terms of trading volume are eligible for inclusion in the index. The index considers only those assets whose protocols are not designed to enable anonymity, avoiding the risk of being associated with illegal transactions and maintain a certain degree of transparency for taxation purposes. With this criterion, LIMEYARD and Decentriq anticipated concerns by regulators and aimed to limit the infringement of KYC/AML standards when using the LYCAI as an underlying for financial instruments. To provide diversification and compensate the high skewness of the market through Bitcoin, the index smoothes each constituent’s market capitalisation by an exponential moving average over the month prior to the relevant review date. The weights are then derived from a sigmoid function which penalises high values without imposing a hard cap. As a result of the weighting methodology, an allocation of large assets is well-balanced compared to other indices. For instance, Bitcoin and Ethereum’s weight as of the end of October 2018 corresponds respectively to 39.30 % and 17.80 % compared to more than 60 % and 13 % for the Crypto Market Index 10 and 30 % (cap) and 23.46 % for the Bloomberg Galaxy Crypto Index. 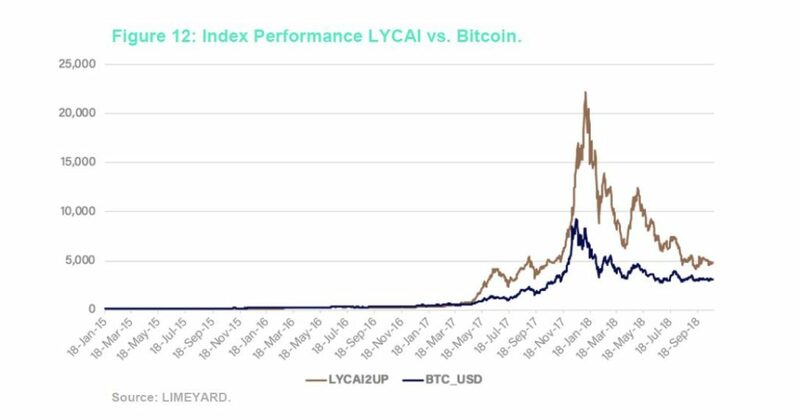 The LYCAI index is the true benchmark for measuring fund performance by cryptographic asset managers. The index meets all IOSCO requirements and the regulators’ current concerns that they have explicitly stated regarding cryptoassets. Coins in the index must be able to be stored in cold storage using hardware in order to be insured by Swiss insurance companies. Coins must have market capitalisation of more than $500 million. The number of assets is fixed at ten in order to reduce rebalancing transaction costs. This slightly revised index concept proves to be very solid resulting in a one-year return of 16.10 % compared to LYCAI’s 0.58 % one-year return. The one-year annualised volatility is 96.49 % compared to LYCAI’s 97.06 %. The one-year volatility is, of course, mainly driven by Bitcoin, the largest asset in both indices. 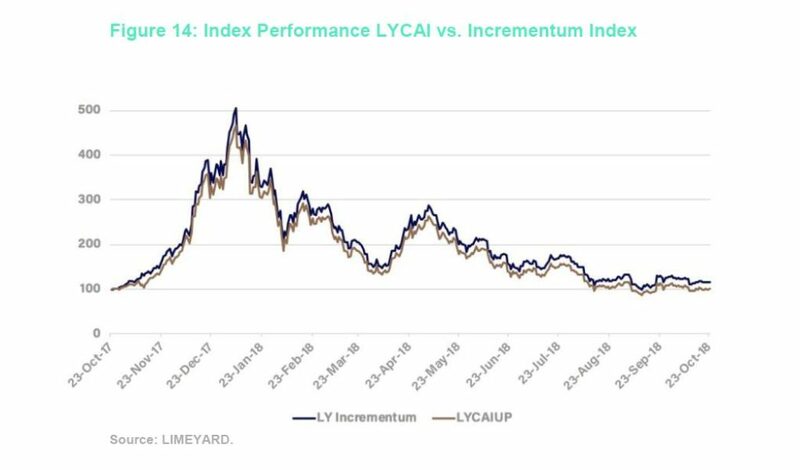 The lower number of assets in the LY Incrementum Index makes the index more tradable compared to the 20 assets in the LYCAI, which is designed to primarily represent the overall crypto market. The Bitcoin market is entering a more mature state. Relevant markets are regulated (e. g., CBOE) with rules designed to prevent potential manipulation. There is a steady growth of Bitcoin futures traded on the CME platform to currently more than $162 million average daily volume (ADV). Various leading investment banks and traditional exchanges run internal projects to further evolve the maturity not only of Bitcoin, but also of other large cap digital assets. Many projects have already been announced, others are expected to be announced very soon. That’s why LIMEYARD continues to invest into strategic partnerships and the development of a broader crypto index family, also covering investment strategies for the passive asset management segment, derived from its leading LIMEYARD Crypto Asset Index methodology.